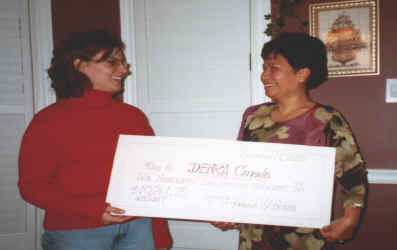 Cris Aberilla, President of Friends of DEBRA , presents facsimile of a cheque for the amount of $10,262.75 to Fran Molinaro, President of DebRA Canada Organization.This amount was raised after a Fundraising dance held at Michaelangelo restaurant in Hamilton. The dance for life was hosted by Friends Of DEBRA. It was attended by over 300 people. There was doubt initially that even 200 people will attend. With a little bit of faith and hardwork by dedicated volunteers, it came to a very successful conclusion. This year it will be bigger and better. It will again be held on October 25 to kick off E.B. awareness week. Fran Molinaro, DEBRA Canada president, has a daughter, Deanna, who suffers from the disease. Epidermolysis Bullosa is a disease affecting mostly children. In simple terms it is a condition characterized by the breakdown of the skin. Basically it boils down to having wounds all over the body that never heals. Imagine never being able to hold your child tight because if you did, their skin would blister or shear off. Imagine every time your child tossed and turned at night they left their skin on the sheet. Imagine having to endure the painful daily change of dressing and bandages to your entire body and limbs. Imagine the pain of having to wake up in the mornings with blisters. Imagine as a parent having to lance them all the while your child cries with pain. Imagine having to eat only soft food or maybe feed through a soft tube to your stomach because if you eat normally, your throat blisters. Well Cris tried to imagine this and formed Friends of DEBRA. YOU might want to help find a cure, or raise awareness, or raise funds to support E.B. sufferers and their families.Help us help them. If you have talent, time or just a caring individual contact us. For more on the disease follow this link: Epidermolysis Bullosa. 1. Contact DebRA Canada directly. 3. Buy great products from our online store and we will contribute 30% of sales to DebRA Canada.